John Chamberlain introduced Caroline Russell as a London Assembly Member and Environment Committee Chair, as well as an Islington Councillor and Green Party Transport Rep.
Caroline started by introducing herself, telling us how she had become a community activist and joined Living Streets as a local campaigner on finding how hard it was to get about the streets with a buggy. She subsequently worked with Cycle Islington e.g. to get a better crossing over Holloway Road at Madras Place. Eventually, in 2014, she was elected as the only Green (and non-Labour) Councillor in Islington. 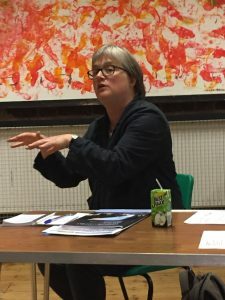 Since 2016 she has been a London Assembly Member working on Transport and Environment and for example, persuaded TfL to trial zebra crossings on bus stop bypasses and to install cycle counters on the Cycle Superhighways. The mayor’s Transport Strategy is really good in pushing for Active Travel. Lucy Saunders’ work on Healthy Streets has great potential as an approach to avoid a clash between residents and cyclists. will buses trump walking/ cycling? In response to Caroline’s recent Question as to how many kms of cycle routes he intends to install in his first term, he failed to give a number, just listing schemes including Liveable Neighbourhoods. How as campaigners can we get consensus? poor design e.g. cycle-pedestrian conflicts at Highbury Corner and at Archway. By now we were into discussion and people were trying to work out how to persuade more people to abandon their cars. Caroline said that she has concentrated on Outer London where giving up the use of a car is unthinkable. So she has concentrated more on Hostile Streets, for example the design of side road junctions with loose corners in which pedestrian have to walk a long way from their desire line in order to cross the road. She also advised us to campaign on Air Quality as cycling is a ‘bit toxic’. However people weren’t really happy about that as we are a cycle campaigning group and we have achieved some results by a more direct approach.